I touched upon the Card Catcher briefly in my writeup on the SG-1000, but didn’t really delve into specifics. Since the majority of SG-1000 games yet to be reviewed were released on Sega’s MyCard format, I feel it wouldn’t hurt to go into some detail on perhaps the most important peripheral for Sega’s first system. The Card Catcher is a device that plugs into the cartridge slot of the SG-1000, SG-1000 II, SC-3000, and the Othello Multivision, and allows the systems to play Sega MyCards. Sega MyCards hold games, just like regular cartridges, but they’re tinier and only have a capacity of 32K of data; needless to say, you wouldn’t see a game like Phantasy Star on a MyCard. Cards were also much more cost-effective for Sega to produce than cartridges. Indeed, once the Card Catcher was released in 1985, Sega effectively said “Screw you” to traditional cartridge releases for the SG-1000. Only nine titles were released on cartridge in 1985 and 1986. The remaining two dozen or so games released for the SG-1000 were on MyCard. Forcing the consumer to buy an additional pricey upgrade in order to prolong the life of the system. Sounds like something Sega would do, right? Well, according to SegaRetro, the Card Catcher only cost 1,000 yen or about ten dollars at the time. I don’t care where you’re from, that’s a smokin’ deal, even for 1985. Sega’s MyCard legacy transcended the SG-1000. When the Sega Mark III was released in Japan in October 1985, the system came with both a cartridge and a card slot built in.The new hardware could play its own Mark III cards and cartridges and was also backwards compatible with SG-1000 cards and cartridges; the SG-1000, of course, could not play Mark III Cards. When the Master System was released in the United States and Europe, the console received its own card games called Sega Cards. 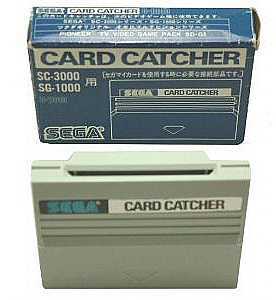 Japanese MyCards were not compatible with the Western Master System, but if one owned a Card Catcher and a Japanese Mark III or Master System, one could play Western Sega Cards through the Card Catcher, which was region-free. As games became bigger, larger cartridges were once again required. 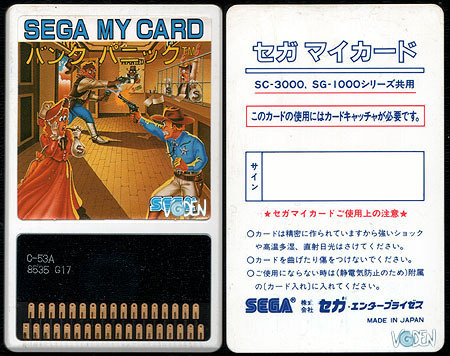 Sega’s MyCard/Sega Card format was retired in 1987, leaving the original Card Catcher without a purpose. The peripheral had a couple good years, though, which is more than even the 32X can boast. The Card Catcher’s greatest achievement by far was extending the lifespan of the ailing SG-1000 by another year. No way that console would have survived past 1985 and the release of the Mark III if Sega hadn’t taken an unwitting precautionary measure. Thanks to SegaRetro.org and Wikipedia’s entry on Sega Cards. If anyone sees any wrong information, please let me know in the comments. 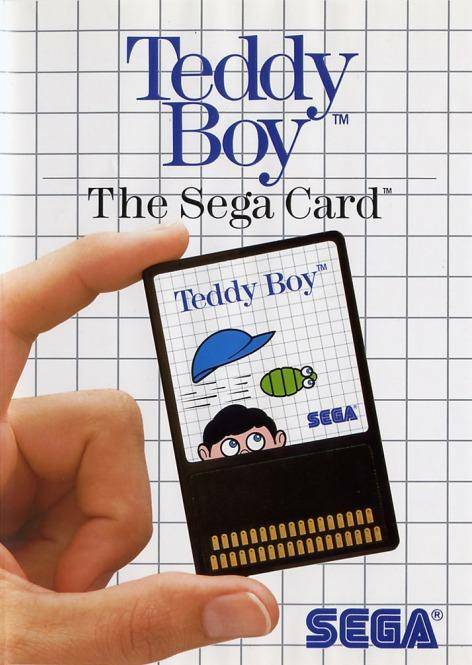 I remember the Sega Cards for my Master System. Boy were they small compared to the cartridges and the console itself. It seemed to be a Sega fetish to have add ons for their consoles. Shame they couldn’t deliver on the promise (and expense) a lot of the time. Yeah, the Cards seemed really tiny. Not as tiny as a DS or 3DS cartridge, but certainly small for the time. Thanks Tony! Sam and I try to keep things lively. Glad you enjoyed it! Great blogs! I discovered Questicle a couple of months ago, and have been reading ever since. This post actually made me think about the N64 RAM add-on that you needed to play Perfect Dark and a few other games (I think it was around 98 or 99 from memory). Taking Sega’s history into account, in retrospect it seems strange that Nintendo tried the same add-on path, however briefly. Keep up the good work! I’m having fun playing along as you go through the systems and can’t wait until you hit the Genesis/MegaDrive. Thanks Axis! Glad you enjoy the blogs. Yeah, the RAM expansion was included with Donkey Kong 64 in late ’99, I believe. After that, I know it was used for Perfect Dark and Turok 3 and… probably other games as well. Glad you’re playing along too. Feel free to comment your thoughts and agree/disagree. When I read the title, I thought it might have been about some unlicensed Yu-Gi-Oh game, but, hey, one of the many console add-ons Sega produced is good too.